In all fairness, I have heard similar stories with the Christensen Arms quality. However, I have also heard of improvements in their barrel wrapping process and great reviews regarding the MPR. I ended up ordering one anyways. I would prefer a Nucleus action over the Christensen so I may try selling the barreled action. It was the chassis I really wanted anyways. I also bought one of their carbon wrapped AR barrels on sale late last year and am very happy with it. Good accuracy and none of the problems stated above. I got mine set up, tomorrow it will go to the range. I've got ~280 rounds of various ammos I think it's 8 different weight/manufactures. I'll be doing break in per their recommendation and them doing some strings to see what it's capable of. Forgive my basement carpet. For the record, once I cleaned all the grease off and lubricated it with the supplied Lucas oil it was very very smooth. Trigger dialed down to around 2 lbs and I'm happy with it there, but it appears to be able to to a tad lower. I'm not sold on the flat triggers but what ever. Stock lock up is very tight and the carbon fiber is solid, loading bipod does not seem to flex the channel at all. Mag changes are smoothish, the catch requires a slight tilt to unlock, it'll drop free if you just don't touch the magazine. Everything was torqued to spec on the rifle, I did remove most screws, cleaned and reapplied thread locker and torqued to spec just to be sure. It's quite a nice looking rifle, initial impressions are good. It cycles dummy loads smoothly as well. I was going to pull the trigger (pun intended) on a CA 338 LM (wasn't quite sure BA Tactical or MPR) after getting my tax return in a few weeks. I think I'll hold off for a SAKO TRG42 or wait to see if there's something else out there. If CA continues to improve, I'll re-examine it later when I do have the funds to get exactly what I want. I do have a lathe to do a re-barrel but if that's the case , I'd get something else. Thanks Primus for the explanation. I ordered one. It can't be any worse than the DTA I owned. Thanks KRcu, I will continue to do my research. My options are open at this time and reloading keeps ammo costs down. At one point I was considering the single shot Savage 112 since I do not plan on firing several hundred rounds on any given range trip. I'd probably be happy with a Savage 110 FCP HS but figured the SAKO would do everything I want. A friend suggested MPA and others tell me to go custom action and have it build the way I want. I thought the CA was a decent mid level gun. First thing I did was take mine apart. A few non glamour photos. The one of the countersink is hard to tell. Looks like they used good speed and feed on their tooling, but didn't apply enough backplate pressure. Not sure if there is a delam, but break through was not clean. This is being nitpicky though as the countersink is plenty good to hold the handguard. 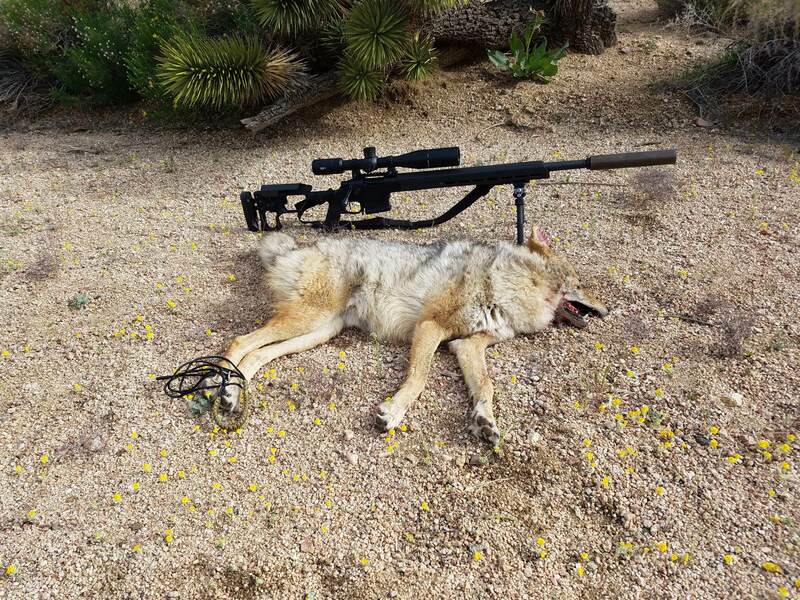 Got my first kill with the MPR last weekend. Called this male in and he took a 140 ELD to the neck. What height scope rings are you running on it? I cant tell if i should order a spurh mount with a height of 1.5 or 1.181 inch. It'll be holding a NF ATACR 7-35. I answered your question in the other thread. Also, as a head up - typically not good forum etiquette to cross post same question on different threads. Just got the call, my 300WM MPR came in to Cabelas today. Good timing since my AMG arrived Friday, just need to figure out a scope mount and I’ll be ready to go. Hope to spend some time behind it over the 4th of July week. I’ll report back with first impressions later. Good to hear the long actions are shipping. Hopefully I'll get a call from Cabela's soon on my 300NM. Anyone heard an update on when the chassis will be available? I called them and asked earlier this year. They said all chassis are going to new MPR rifles. They said not to expect a chassis for sale individually before 2019. Did you get the scope rings or mount figured out for your AMG? I have the same setup coming. I ended up picking up a Spuhr 3001 mount from somebody here on the forum. Did some measuring once I got the rifle home, and the 1.18” height should be perfect...plenty of room for scope caps, but not a huge gap over the barrel. It’s supposed to arrive today, so I’ll post a pic or two this evening once I get it mounted. Ok, just got the scope mounted...the Spuhr 3001 is perfect for the AMG on the MPR in my opinion. I started with the cheek riser bottomed out, and it was slightly too low for me...lifted up maybe 1/8” or so and it’s perfect now. Here are a few pics. Not a big fan of the caps this scope came with though, I’ll be ordering some Tenebraex replacements tonight. Mine is still shooting half MOA. Anyone else received their long actions? Still waiting on my 300NM that I ordered in early February. I saw pictures of a .338 on facebook. Owner had posted a range report. Yes. My 300NM ordered through Cabela's showed up last week of June. Haven't gotten out with it much though yet so not much to report. Career Poopatician aka "Turd Herder"
I was able to stop by one of my favorite gun shops today and the guy showed me this thing! while ive never cared for any of their other rifles this caught my eye mostly because of the chassis that its in and the over all weight. anybody have any idea of a similar set up that is avalible? doesnt look like the chassis is avalible yet but im going to do some more research. Has anybody had much hands on with this rifle (Chassis more so)? thoughts? opinions? I just like it because its a hunting weight rifle in a chassis and that would make scope sharring a lot easier. or would most the weight savings come from the barrel? either way its a goal for what id like to turn my hunting rifle into... barrel and all. I like it as well. I think there's 2 threads on the rifle and tons of info there. Far as similar options The Fix by Q and maybe a build in an XLR carbon with a Proof otherwise no there isn't really anything else. I think the LW chassis rifle market will grow exponentially in the coming years though. I have one. I bought it mostly for the chassis since I called CA and they said the chassis alone would not be for sale until 2019. The plan was to sell the barreled action and build my own, but when I tested it, it shot accurate enough for me to just keep it. Well I can probably wait till 2019. I've got quite a few plans for this gun i just really liked the chassis when I picked it up. I'm going to call anyway and see if they have any idea of the coming price point. As far as looks I'd much rather this than the xlr but I dont know that function would be much different. I sure hope that there are more LW chassis hitting the market. Thanks guys. And I'll have to look a little harder for those other threads. I've looked at and handled them in one of the LGS and really like the feel of the chassis. The chassis is what I'm ultimately after, it's a shame they won't just sell it by itself because I think they would sell a bunch of them if the price was competitive. My buddy had one (maybe he still does?) and it was plenty accurate and was a solid hunting rifle. We also shot steel at long range prone at my ranch and it did very well. It did not do all that well as a PRS rifle though. Way too light to hold still on wobbly barricades, and too much recoil to make quick follow up shots even with a good brake. FWIW, he's won local club matches with purpose built rifles, but maybe only placed mid pack or so with it when he tried it. I think that's a fair point, I'm not trying to put together a do it all rifle but something that feels familiar and I dont think this chassis would limit its ability to be a good hunter. I'll give them a call and see what the plans are for the chassis in the foreseeable future. Any ergonimical errors/ dislikes about the stock? Seems like a lot of people are thinking along the same lines as me. The chassis itself has great ergonomics and very well made. I don't think it had provisions to mount an arca rail, so if you hunt from a tripod you will need to figure something out. I don't remember much else I could pick on. Read those main threads though, lots of good info. It actually has Mlok slots on the bottom so you should be able to run one. I'm assuming you mean full length as I have a short one for tripod. I do like the complete rifle, but really the chassis is the highlight. Lightweight, adjustable, Mlok slots, and right side folder. That last point is a big deal to me and really helps packability. Facebook can be taken with a grain of salt but I commented on a pic of the MPR right on the CA Facebook page asking about the sale of just the chassis and their reply was there is no plan at this time to sell the chassis as a stand alone product. Has anyone tried a vertical grip on the MPR yet? I'm curious if the MPA vertical grip will work. The stock grip is a little too swept for me. I went with Royal Arms target grip, it’s not perfectly vertical but close to. It’s a standard AR grip, and bolted up the MPR just fine. If the MPA grip is also, I can’t see why it wouldn’t work. Got to handle one at my local gun store. Like the stock a lot. The action and trigger were great. It was a 6.5cm with a ~24” barrel. All in all a nice handling package. Personally I would love to see them selling the chassis by themselves. Looking for a review on a 16” 308 as well. I have/had 2 other Christensen Arms rifles (ridgeline 300wsm and classic carbon 300wm), and both shoot 3/4” Or less with every factory ammo I’ve shot out of them. Granted I only tried one type in each, but maybe I just got lucky picking. Also the stocks are nothing to write home about. The top tier rifles are suppose to have higher quality stocks, but I couldn’t even start to compare the ones I have to either Manners or McMillan. I got one in 6.5 PRC 26" CF barrel paired with Vortex HD AMG and Evolution CF bipo..Love it. Well made, tons of features and etc. In my opinion, one of the most nice looking rifles in the market today. With Hornady 143 ELD-X AMMO I'N GETTING 2950 FPS and with 147 ELD its reading 1845 fpds. Agreed...they are gorgeous. I’ve had more questions about this rifle than my full blown customs. Got mine put together. Looking pretty sharp. What grip have you guys settled on at this point? After trying a few, I ended up with a Royal Arms target grip. Not going to lie, it’s ugly...but it feels/functions great. Nice. Do you have anymore pics of your long action? Not really, just these two poser shots before sighting it in. anyone having still having problems with your impact walking due to the barrel getting hot? Since they rebarreled mine it has been perfect. I've shot 2 others, a 308 and 338. Both were on the money. Seems the barrel issue is random. Had mine in the pouring rain all weekend. Took it apart completely to clean last night. I expected a good amount of corrosion, but I only found it on a sling swivel. The receiver and bolt were perfect. I’ve had corrosion on nitrided receivers before that have seen less moisture. Glad I found this thread. I have a MPR in 300 norma on order and there is some good info here. J741 have you been able to put that 300 norma mag to work yet?